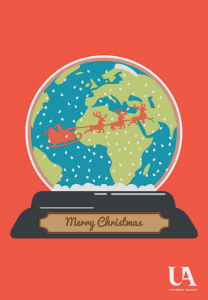 Santa on his sleigh delivering presents around the globe. Citizens bringing gifts by train to neighbours in a nearby city. Woodland animals working together to decorate a festive tree. What do they all have in common? 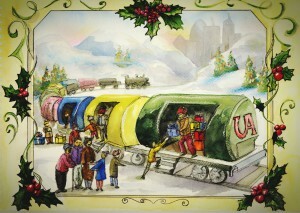 They are all winning designs produced by UA students and staff for the cover of our Christmas card. 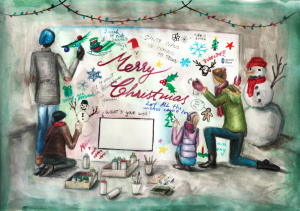 Now in its sixth year, we have kicked off the search for the 2017 University Alliance Christmas Card Design Competition. This year, the theme is ‘excellence’ and we are looking forward to seeing how illustrators, designers, photographers and computer artists within our universities interpret this in their work. To inspire you to take part in this year’s competition, we’ve found some of the best festive works of art from entrants over the years. Looking back at these images, it’s clear to see the wealth of creativity that exists in our group of universities. To take part or advertise the competition to those who might want to enter, please either link to this page or send the details below out. Please note that this competition is only open to staff and students from Alliance universities. 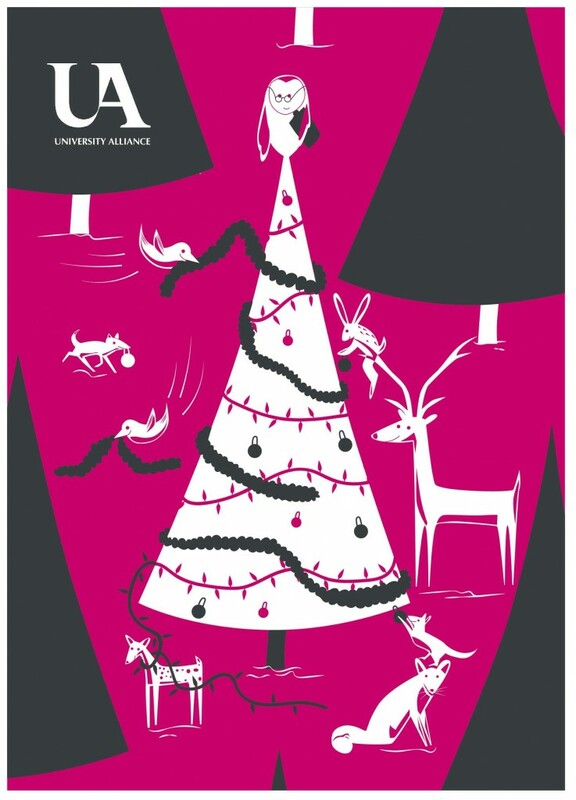 Design the front cover for University Alliance 2017 Christmas card. The winner, as well as designing our new card, will receive £150 in High Street gift vouchers (Love2shop) and will be credited on the back of the cards which will be seen by hundreds of key figures, including MPs, leading business executives and university Vice-Chancellors and academics. 2013’s winning design came from Jennifer Leem-Bruggen, a student on the BA (Hons) Illustration course at University of Hertfordshire. Our theme for this year is ‘Excellence‘. Closing date: midday, Thursday 30 November 2017. Submission: Send your image to info@unialliance.ac.uk with the subject line ‘Christmas card competition 2017’. Please include your name, course/occupation with the name of the university you attend. Include a paragraph (50 word limit) about the image, what it is and what inspired you and how it is inspired by the theme. The University Alliance team and guest judges will judge the competition and decide on the winner. The runners up will be posted on our website along with the winning image. The judges’ decision is final and no correspondence will be entered into. The winning entrant retains copyright of the original design and ownership of artwork produced for this competition. 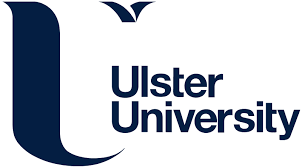 The winning entrant grants a license for University Alliance to use the image for the purposes outlined in the annual competition brief for the one year duration of the project including print and online publicity and promotion of the competition only beyond this date. The winning entrant will be informed of their selection as soon as possible after the judging has ended using the contact details supplied. All entrants to the competition accept that we may not be able to wait for acknowledgement from the winning designer before print production commences.